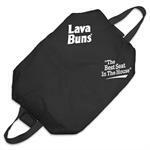 LAVA BUNS - Warming/Cooling Cushion - Made In The USA! Lava Buns is the most versatile cushion you'll ever own! Lava Buns is a revolutionary new cushion that retains heat for up to six hours and cooling for up to 4 hours. Simply remove the Microcore Element and place in a conventional microwave oven...heat for a few minutes...and you've got a super-comfortable heated seat that will keep you warm where it counts. LavaBuns can also be chilled in your refrigerator or freezer for a few hours or overnight and you have a cooling cushion. And it is so soft and comfortable....you'll want to use it as a regular seat cushion. Also can be used for spot cooling and warming for your back, head and other areas. Microcore element made and assembled in USA! 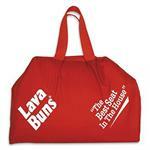 Lava Buns are easy to use, lightweight and durable. It folds into a convenient carrying size, fastens with a Velcro® closure and goes where you go! Its Teflon® treated Dupont® cover also resists stain and water. Use for hunting, fishing, outdoor sports, spectating, getting in that cold car in the morning or whenever you want some warming or cooling comfort. Bleachers can get icy cold in the winter and hot in the summer, but you'll have the "Best Seat in the House" with LavaBuns so you can enjoy the game. Size: Measures approximately 12" x 18" opened and 12" x 9" folded. Colors: Red, Navy, Black. See available colors above. ● No electric cords or plugs. ● Makes a Great Cordless Heating or Cooling Pad! Use for your back or other areas! ● Portable and Reusable. Stays Warm up to 6 hours. ● Easy to Tote, Convenient to Use. ● Durable Stain and Water Resistant Teflon Treated Dupont Cover.